FLORENCE, Italy — One aspect of corporate foreign policy that is not any longer so basic a tenet as it was during the latter part of the 20th century is the necessity of being or at least appearing neutral. Neutrality may be defined as the state of not supporting or helping (physically and ideologically) either side in a conflict or disagreement. Exactly because for a multinational company, corporate foreign policy, which subsumes in its definition corporate diplomacy and geopolitical due diligence, is becoming central to winning internationally, a basic neutral approach is too limited to guarantee in every instance positive results. Starting in the mid-1980s, international companies have presented themselves as a sort of apolitical players, which, among their core goals, have an interest in the advancement of the societal environment of the countries where they invest. Indeed, this attitude is a complete sea change from the corporate foreign policy of the 1950s and 1960s when companies often carried out a neocolonialist strategy, which strongly influenced the internal politics of many weak states. A good example of the neocolonialist behavior was the complicity of United Fruit Company, an American corporation that traded in tropical fruit, with the U.S. government in the 1954 coup in Guatemala. A coup that ousted the democratically elected leader of Guatemala, President Jacobo Arbenz, and resulted in more than three decades of military strongmen at the helm of the country. Since the mid-1980s international companies have shunned any political involvement, while at the same time they have tried to implement a good corporate social responsibility (C.S.R. ), to protect and improve their brand perception and reputational risk management, to cultivate stakeholder management, and to adopt better public relations with N.G.O.s. With hindsight, these promotional tools have never given the international companies a real edge with reference to high-impact geopolitical events such as coups, regional and civil wars, internal power struggles, changes in the political status of key local partners, and changes in the public sentiment toward the company. In other words, only through their neutral approach and the tools developed after the mid-1980s, the international companies cannot really protect themselves and thrive in the much more unstable world that emerged at the end of the Cold War. A clear illustration of the problems deriving from maintaining a neutral approach concerns the energy investments in Iraq proper and Iraqi Kurdistan. The latter is also known as the Kurdistan Regional Government (the K.R.G.) and is a semi-autonomous region within Iraq. Without entering into too much detail, it’s important to understand that after World War I, for all the 20th century, the relations between the Kurdish population based in what is today’s K.R.G. and those who exerted their rule over that area had been very tense and experienced several episodes of violent conflicts. The relations between Erbil and Baghdad worsened again at the end of 2007 when the K.R.G. started signing production sharing contracts (P.S.C.) with small- and medium-sized companies without prior authorization from the federal government — in addition, the latter has never signed P.S.C.s but only technical service contracts (T.S.C.s). Baghdad has always said that it alone has the right to negotiate and sign energy deals for the whole Iraqi territory, the K.R.G. included. Instead, Erbil insists that Iraq's Constitution allows it to agree to contracts, and as a result to ship oil independently of the central government. In October 2011, tensions rose to a higher level when the U.S. supermajor Exxon Mobil, a company that was already the operator of West Qurna 1, a giant oilfield in southern Iraq, signed an oil deal related to the development of six exploration blocks in the K.R.G. — in December 2016 Exxon Mobil pulled out of three of these six blocks, but this move was not due to Baghdad’s pressure. Exxon Mobil was the first supermajor to sign oil deals with Iraqi Kurdistan, and the federal government was literally scared that Exxon Mobil could act as a sort of trailblazer opening Iraqi Kurdistan to Big Oil investments. In fact, for Baghdad, one thing was to confront a K.R.G. receiving its economic legitimacy from small- and medium-size oil companies, one completely different thing was to confront a K.R.G. receiving its economic legitimacy from the supermajors. The federal government wanted to appear resolute against Exxon Mobil — as it had done until then with the small- and medium-sized companies that had invested in the K.R.G until then. So, Baghdad immediately menaced to push Exxon Mobil out of Iraq proper stripping the company of its West Qurna 1 contract — the U.S. company had a 60 percent share in that oil field — if it hadn’t relinquished its Kurdish investments. Today, after almost 6 years, Exxon Mobil is still an investor in both the K.R.G. (with three blocks) and in Iraq proper (in West Qurna 1, where it’s still the operator, although with a 25 percent share). In Iraq (Iraq proper and the K.R.G. ), there is a sort of dichotomy regarding the energy investment strategies on the part of the international oil companies (I.O.C.s). In practice, some companies have decided to invest only in the K.R.G. (among them, U.S. Chevron, Korea National Oil Company, China’s Addax Petroleum/Sinopec, and Norway’s D.N.O. 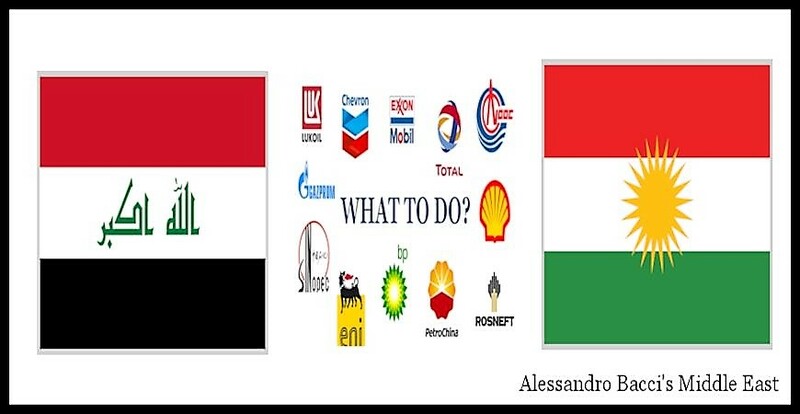 ), while others have decided to invest only in Iraq proper (among them, British Petroleum, Anglo-Dutch Shell, Japan Petroleum Exploration Company, Russia’s Lukoil and Rosneft, and China’s Cnooc and C.N.P.C). The only energy companies that escape this dichotomy and consequently have investments in both Iraq proper and the K.R.G. are Exxon Mobil, Russia’s Gazprom, and France’s Total. A neutral approach may be useful when in a country there are completely unstable political conditions (for instance, military clashes/open war), and when it seems probable that in the short term there could be a clear and definitive political solution. But, when the quarrelling parties are not physically fighting between themselves, and when it appears highly improbable that there will be a final arrangement any time soon, a neutral approach may represent for a company only a lost economic opportunity. In the case of the K.R.G. and Iraq proper, neutrality is probably not useful. Both the K.R.G. and Iraq proper have oil and gas reserves located in areas that can be easily protected from the Islamic State — Kirkuk oil fields may be more exposed, but let’s focus our attention only on the fields within the K.R.G. and on those in southern Iraq. Moreover, it seems evident that the tensions between Erbil and Baghdad won’t be gone soon — these tensions date back several decades. In fact, if the emergence of the Islamic State and its destruction of the Iraqi side of the Kirkuk-Ceyhan pipeline has forced the K.R.G. to build its system of export pipelines, which could be seen as a first step toward a K.R.G. economic independence, it also true that low oil prices, a complicated geopolitical environment, and oil reserves not as large as initially thought — a better assessment is needed — could induce the K.R.G. to continue with its tense cohabitation with Iraq proper. In the end, can international companies wait for a real improvement in the relations between the K.R.G. and Iraq proper before doing business in the area? In other words, can they wait for a political improvement that might occur one year, three years, five years, or ten years from now? The answer is no, because as usual uncertainty is business’s worst enemy. In Iraq, neutrality is a way to lose economic opportunities. Instead, if companies want to succeed, they have to decide where they want to invest and then they have to act consequently. In other words, for Baghdad it was very difficult, because economically unappealing, to strip these three companies of the contracts signed in the previous two or three years — contracts of paramount importance for relaunching and expanding the Iraqi oil sector. But, it’s Shell’s approach that confirms how a corporate foreign policy based on a neutral approach could have been a very risky option in Iraq. In fact, if, on the one side, Shell was part to the initial negotiations that Exxon Mobil developed with the K.R.G. in 2011, on the other side, it was already deeply involved in Iraq proper with relevant investments. In fact, Shell was Exxon Mobil’s junior partner (15 percent share) in the West Qurna 1 field (8.7 billion of recoverable barrels of oil) and the operator (45 percent share) in the Majnoon field in southern Iraq (13 billion of recoverable barrels of oil). But, at that time, Shell was also in the final stages of the talks that would end in November 2011 with the signature of a $17.2 billion’s worth deal with the federal government for collecting and processing all the natural gas from three of Iraq's giant southern oilfields, i.e., Rumaila, West Qurna 1, and Zubair. In the end, Shell’s real interest in Iraq weights the balance in favor of investing in Iraq proper only. If Shell had signed a deal with the K.R.G., the federal government might have scuttled the gas deal, which was the weak link for Shell — for the same reasons explained above in relation to Exxon Mobil and its investment in West Qurna 1, it would have been quite difficult to strip Shell of the Majnoon contract. Moreover, what is sure is that for Shell a neutral approach would have meant not investing in Iraq proper nor in the K.R.G. with all the economic lost opportunities that this action would have encompassed. This article covers the topic of the video “A Neutral Stance Doesn’t Help Energy Companies in Iraq,” which was released on April 4, 2017, on Alessandro Bacci’s Middle East.